Malin + Goetz has launched Stem, a new unisex fragrance. Additional notes include rose centifolia stems, jasmine , white cedar, vetiver and ambrox super. 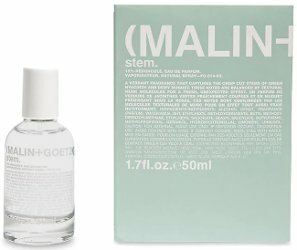 Malin + Goetz Stem is $95 for 50 ml Eau de Parfum. Oh, this sounds interesting, that smell of gardening that lingers on hands is great. I agree..this sounds good to me. Could be. For some reason the “softened by a trio of modern musk molecules” made me suspicious — hope it is not too clean or detergenty, but we’ll see. I was pretty sure I’d be untempted by perfume this year (I. Seriously. Have. Enough. ), but ohhhhh…. This sounds good. Perhaps similar to Green, green, green and green? The bottle even looks similar! Dear Malin + Goetz: your packaging is so medical-looking! How about some kitties? As a chemist and a cat person, if this had kitties in lab coats, I would have to buy it no matter what it smelled like! I’m a bottle person. I’ve passed by many great perfumes because the bottles are to sterile looking. I’m not proud of it, I am just a sucker for a glamorous bottle. Got this in the mail today. What a total letdown. Doesn’t smell green at all. Smells like dryer sheets thst sound called dewy valley or something like that. The smell of this vs the price…I won’t be trying any of their other products. Just smells so cheap. My goodness am I disappointed. So synthetic smelling. Anyway…benefit from my mistake: try before buying or just pass altogether.